This six-lesson series encourage children to be bold witnesses for Christ. Following Paul’s missionary journeys, these lessons look at how God’s message could not be stopped. Lessons cover Paul’s encounter with Elymas, Paul and Silas praising God even while in prison, Paul’s sermon to the people of Athens and God keeping his promise to Saul even through a shipwreck. The series also includes a topical lesson on the Armor of God and a mission themed party club. 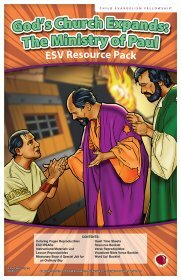 Includes additional GNC resources: ESV verse visuals, Word-Up visuals, resource booklet, reproducibles, time line pictures, map pictures, missionary story Special Job for an Ordinary Boy, coloring sheet, UPS rules. Includes additional GNC resources: Word-Up visuals, resource booklet, reproducibles, time line pictures, map pictures, missionary story Special Job for an Ordinary Boy, coloring sheet, UPS rules. Disc 1: Overviews, Gospel Spotlights and complete Bible lessons demonstrations. Disc 2: Wonder Time, counseling, memory verses and full demonstrations of all songs suggested in the series: Children All around the World, Did You Ever Talk to God Above?, Good News to All the World, I Believe, I'll Stand for God, Stop/Go, Trinity Song, Turn Your Eyes to Jesus, What's the News? Romans 1:16 (I Am Not Ashamed).